A quick reminder before this goes live! 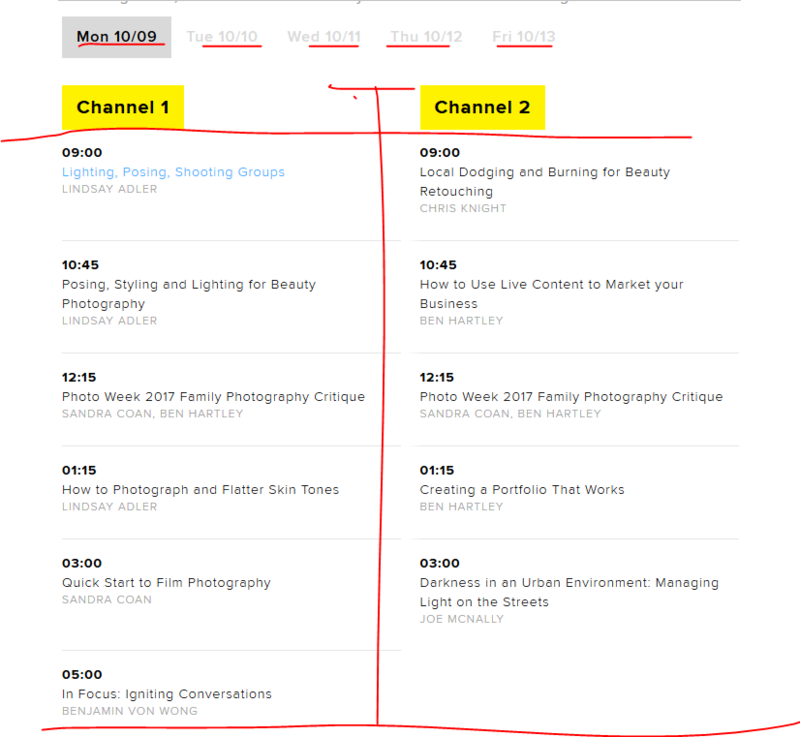 Running today (Wednesday 10/25/17) from 12pm ET to 7pm ET you can watch LIVE and for FREE the world premiere (and recording) of a new class by Jared Platt, Lightroom CC for the Professional Photographer at CREATIVE LIVE. You can watch this class for FREE while it is recording live. If you like the class and want to watch it again, you can purchase it for $39 as a pre-order special. + these are FREE to watch while they are on the “ON AIR” schedule page and have the “Free Broadcast” or “Free LIVE Broadcast” tags on them. Apparently they rerun some classes for FREE as well, they are not only free during their original recording. Happening now, recorded LIVE on Monday (today) and Tuesday (7/4/17), John Greego is teaching his Canon 5D Mark IV Fast Start Class on CreativeLIVE. The class is FREE to watch while it is recording during these two days. But if you want to watch it later, you have to buy it. This is the CreativeLIVE philosophy, free to watch when it’s originally recorded, but you pay to watch later. Good until Wednesday night (7/5/17), CreativeLIVE is offering 50% 15 Photography Classes. Four of them are on lighting, two of them are on people and portraits, and more in food, landscape, night, Photoshop, color, and more. The price you see is the price you pay. There is no coupon code. Photographer Chris Bray is offering a 1.5 hour “Introductory Photography Course” for FREE at Udemy. You need a Udemy account to sign up for this. It is free to create a Udemy account. The class is 1.5 hours of on-demand video, with lifetime access. Good until Saturday night, CreativeLIVE has a 50% off sale on portrait photography classes by Photographer Sue Bryce. The price you see is the price you pay, there is no coupon code to enter. But if you prefer not to pay, and you have schedule flexibility, you can watch classes for FREE when they are originally recorded online. Check their ON-AIR SCHEDULE for the upcoming schedule. There’s a variety of classes, including camera-centric courses (eg Canon 80D, 77D, D-Rebel T7i, T6), Adobe Lightroom, wedding, story telling, business, sports and more. CreativeLIVE has launched a Weekend Sale, featuring select photography classes for $19 each until Sunday night. No coupon is needed, the sale price is shown on their website while this promotion is running. Topics covered in the sale classes including wedding, posing, speedlight, post-processing, droning, scrapbooking, and more. But if you prefer not to pay, and you have schedule flexibility, you can watch classes for FREE when they are originally recorded online. Check their ON-AIR SCHEDULE for the upcoming schedule. There’s a variety of classes, including camera-centric courses (eg Canon 77D and D-Rebel T7i), Adobe Lightroom CC crash course, wedding, story telling, business, sports and more. Streaming LIVE today for FREE is a “Sony a6500 Fast Start” class with John Greengo at CreativeLive’s Free On-Air Classes. While the class is recording live, it is FREE to watch for all. You can page further down the page to see other upcoming free-streaming classes. Of camera interest, there is a Nikon D5600 Fast Start class starting June 7, a Canon 77D Fast Start on July 6, and a D-Rebel T7i Fast Start on July 7. You can also filter the upcoming classes by clicking on the gray horizontal tabs over there. CreativeLIVE has a new flash sale, you can get up to 40% off on select Adobe Classes. The prices reflect the sale, there is no coupon code to enter. New classes entered their database this week as last week was Photoshop Week with a number of new classes recorded. But if you prefer not to pay, and you have schedule flexibility, you can watch classes for FREE when they are originally recorded online. Check their ON-AIR SCHEDULE for the upcoming schedule. There’s a variety of classes, including camera-centric courses (eg Fuji X-T2 [still on-sale for $1500 to $1516], Canon 5D IV, Nikon D750, Olympus E-M1 II, etc). Good until Saturday (May 20), it is Photoshop Week at CreativeLive with lots of Photoshop-related classes streaming live. It is FREE to watch any of the classes that are streaming/recording for the first time ever, so if you have flexibility with your time, you can watch a LOT of Photoshop classes this week! CreativeLIVE is having a new limited time sale, up to 40% off b>! View select Photography Fundamentals classes. No coupon is needed, the sale is factored in on their website while the promotion is running. OR if you prefer free classes, check the latest ON-AIR SCHEDULE. You can watch any class for free when it is recorded LIVE on their website. After it is recorded, you have to pay to watch it. The upcoming schedule includes classes from Lisa Jacobs, Joel Comm, along with camera guide type of classes (Fuji X-T2, Canon 5D IV, Nikon D750 and D5600, Olympus E-M1 II, Sony a6500, etc). Note also that PHOTOSHOP WEEK is currently underway. Check the schedule above for classes. It’s the first “On Air” box at the top left corner of the page!